LIMESA meters s.r.o. started in 2012. However, the company’s history goes far deeper into the past. A Czechoslovak machinery maker, Elitex a.s., established adepartment in 1989 to focus on heat and flow measurement using the electromagnetic induction principle. Elitex split up in 1994 whereupon the flow meter department management founded EESA s.r.o.. Rapid development of the new business followed. Proprietary flow and heat meters were designed while annual production volume increased to between 1500 and 2000 meters. The company thereby took a firm position among leaders in flow and heat measurement in the Czech Republic’s market, and new customers were further acquired in Europe, Americas, and Asia. In 2005, an associate business, LIMA-tool s.r.o., was set up. Besides other activities, it supported development and production of magnetic flow meter mechanical parts, especially flowtube Teflon liners. LIMA-tool began servicing the entire range of EESA meters in 2011, thus becoming EESA’s authorized service provider. EESA meter development had already been discontinued then. Therefore, LIMA-tool management decided to preserve the long manufacturing tradition and to develop its own flow meter. As part this undertaking, the management made a deal with former EESA development and production staff. LIMA-tool and former EESA employees together started a new company, LIMESA meters. Its core business is development and production of its own flow meters, all mechanical parts, Teflon liners, etc. All related flow meter technology services are covered as well. This results in a complete production scheme that draws on more than 25 years of expertise that includes entire technology to make magnetic flow meters such as production of all mechanical components, PTFE liners, development and manufacture of electronic units and application software. The final product is highly reliable FG4000 line of magnetic flow meters in modern industrial design with comfortable user environment. 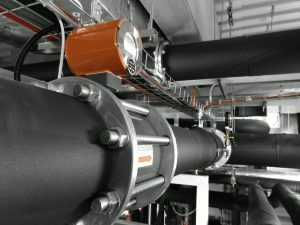 Furthermore, the proprietary flow measurement principle also provides high accuracy over the entire dynamic range, minimum pressure drop due to the metering profile without any mechanical parts as well as other features described in each data sheet and specifications for installation use. The flow meter has, of course, passed all the appropriate tests in authorized laboratories with emphasis on increased resistance against electromagnetic interference in compliance with category E2 pursuant to EN ISO 4064-5, and on high ingression protection rating, IP67.